The day after the tsunami, we wondered if we’d be attending our first Luau… obviously, we made it! 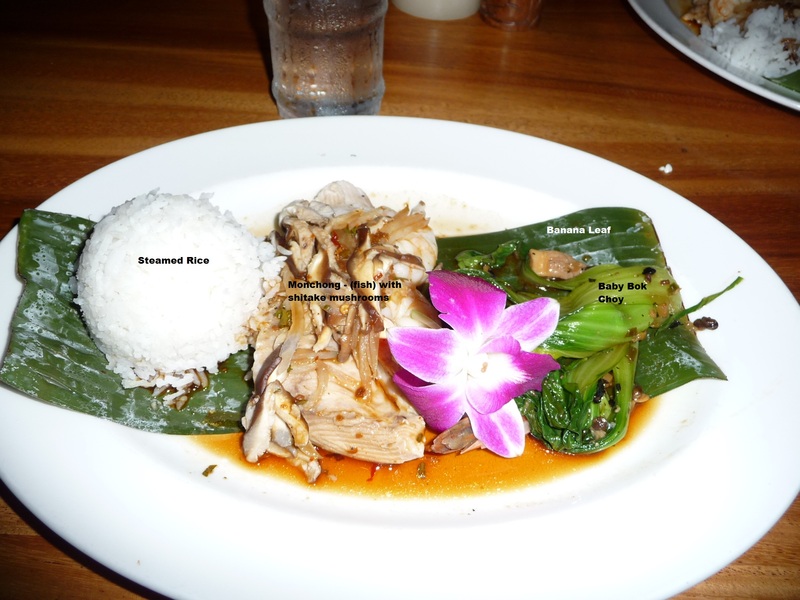 The Luau we chose is called “Old Lahaina Luau” and claims to be the most authentic on Maui. It’s located literally ocean-side in Lahaina. We’d heard that there were spots in Lahaina where the tsunami waves actually came up over the road and we were pretty sure that damage could easily have occurred at the Luau site – so I phoned in the early afternoon to find out. Luckily, the only damage was a bit of debris here and there and yes, the show would go on! I was SO happy! Not sure if John really gave a rip, one way or the other, but in the end we both thoroughly enjoyed the food, the company, and the show. Here we are, lei-adorned. 🙂 We were seated at a table for eight and had a nice visit with our tablemates across the way who were from South Dakota. They were as excited as we were to enjoy some glorious Hawaiian sunshine at the end of winter. 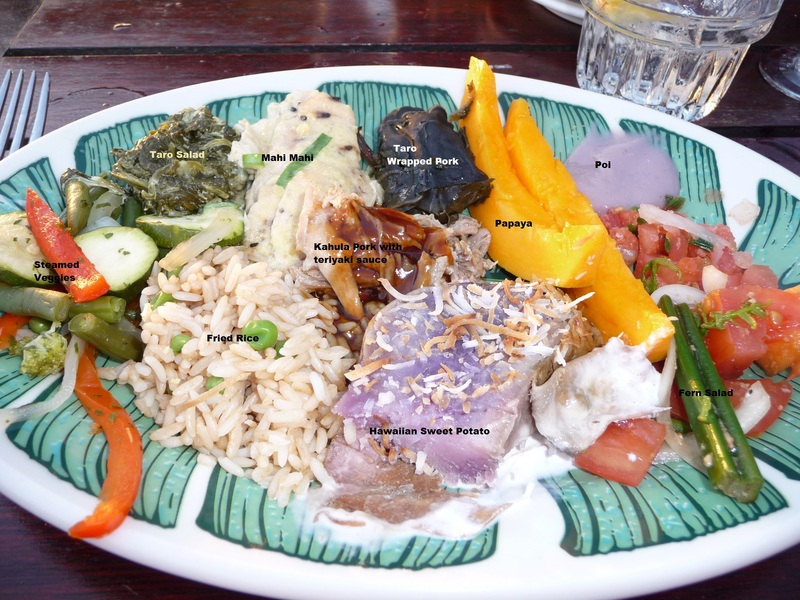 Next is a snapshot of my plate of food from the luau. I named all the different foods on the plate…. hopefully you can read it, but if not, click on the photo and it should be better visible. 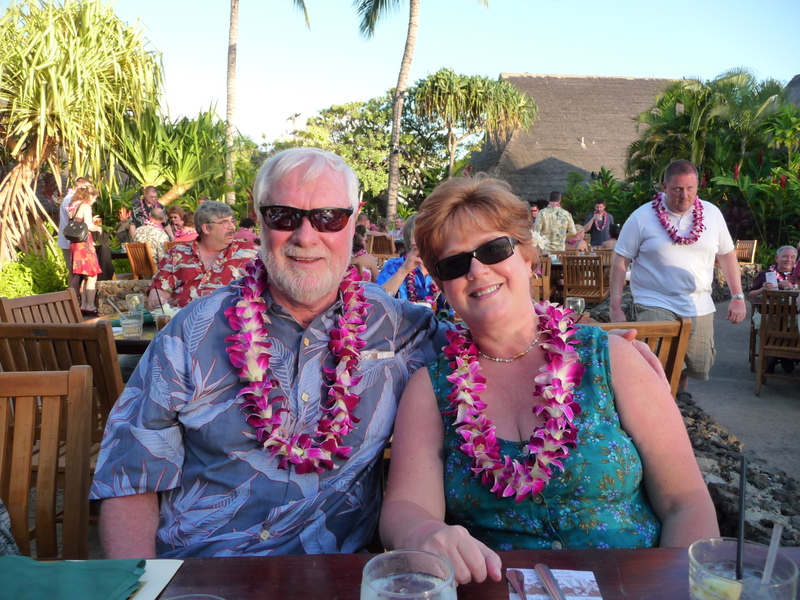 The food at the luau was a buffet – all you can eat, and honestly- everything was delicious!! 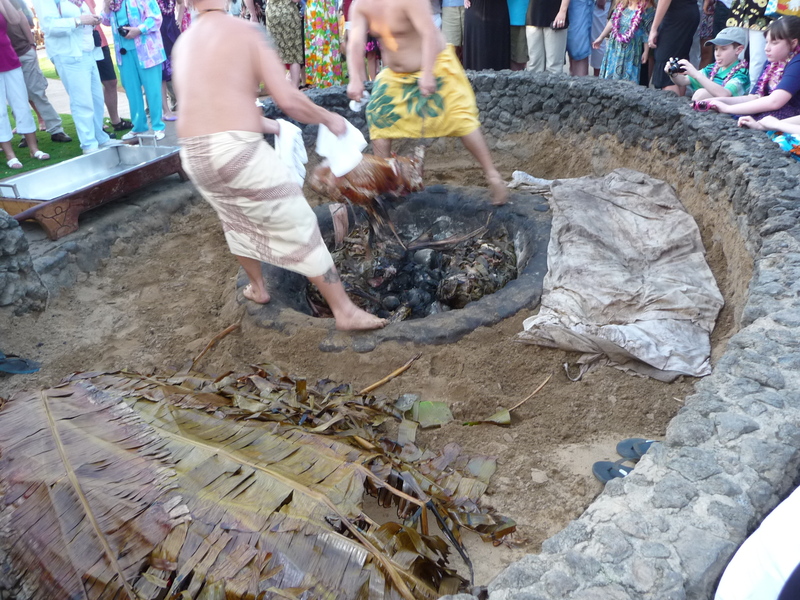 Prior to the meal, we were invited to the ceremony where they lift the pig out of the pit where he (I have decided to assume it was indeed a he) cooked in the ground for apparently many hours. Here’s a photo of the lifting of the piggy! If you look closely, you actually CAN see that it is indeed a swine. I must say, he was QUITE tasty. Of course no luau would be complete without the wonderful hula dancing. Here’s a snap of some great hula dancing! The luau was a big hit with both of us. I definitely recommend attending at least ONE luau when in Hawaii. It’s a must! What could top that? Well let’s be honest, nothing. At least not this trip. We didn’t have time to do SO many things that we wanted to do. Drive the road to Hana. Go to the top of Haleakala. Guess that will all have to wait till the next time. 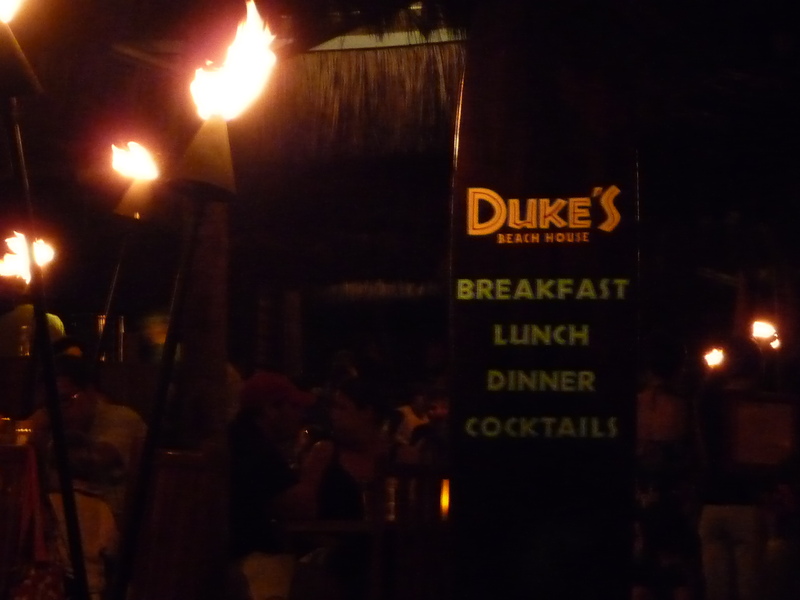 We did however take a walk the evening of the kayak trip along the sand, not far from our condo, to Dukes – an open air, on-the-beach restaurant. Again, we had a delightful and healthy dinner. And again, here are a couple of pictures to prove it. Before we new it, it was time to think about that long flight home. Honestly, we hated to say goodbye to Hawaii so soon. I hope we can go back again someday… we left a lot UNdone on the island of Maui. On the day of our overnight flight, we drove around part of the north of the island and stopped at Kapalua Golf Club for a late lunch. The restaurant there was called the Pineapple Grill and okay, I’ll admit it, we stopped because I had a “buy one entree, get one free” coupon. I’d also read on TripAdvisor.com that this was a nice restaurant with good food and great views of the golf course. Golf courses make my significant other a very happy man, so what the hey, why not stop? We DID indeed have a great lunch and while reading those reviews on TripAdvisor, people kept mentioning the signature dessert at the Pineapple Grill … the Maui Gold Pineapple Upsidedown Cake. This was our one real indulgence of the trip …. it was to-die-for-delicious!!!! 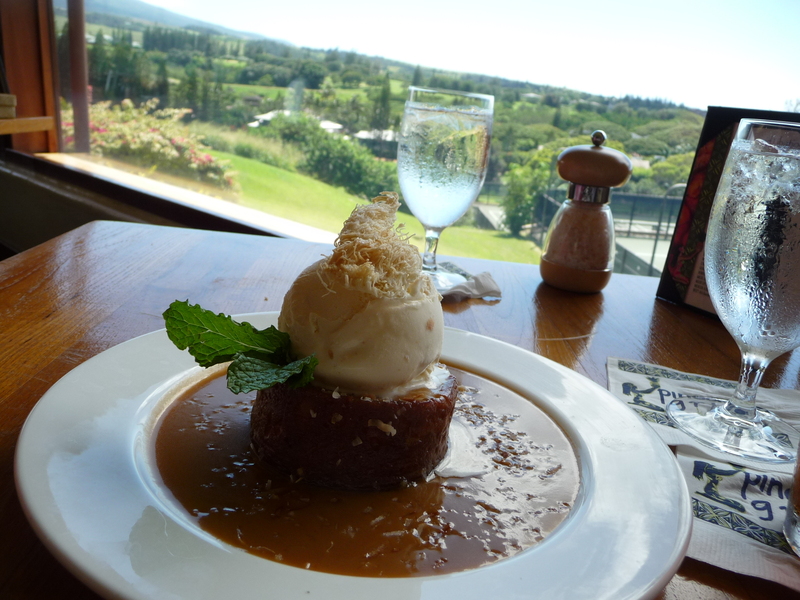 Pineapple upsidedown cake with caramel-rum sauce and a scoop of coconut-macadamia nut ice cream on top. We shared this and still didn’t finish it. This entry was posted in General Musings and tagged Dukes, Humpback whales, kayaking, Maui, Pineapple Grill, snorkeling. Bookmark the permalink. If you had taken your friend Molly with you, I assure you there would have been no wasted dessert! I’m glad you guys had a good time. Love the pics … especially of your faces. I miss them.